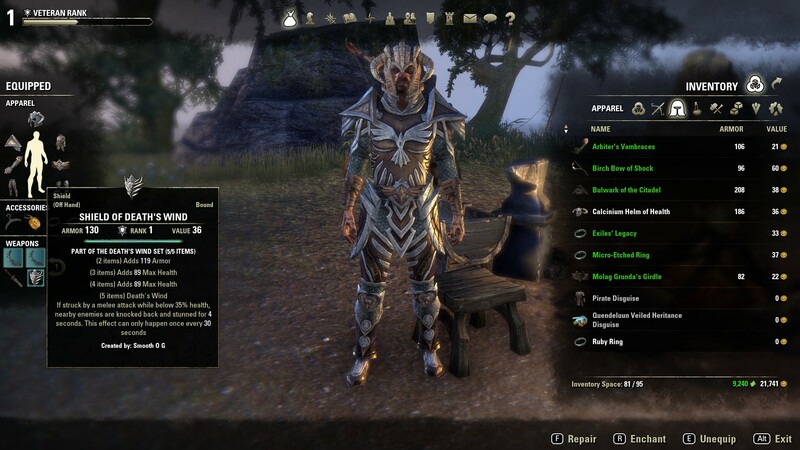 Woodworking in Elder Scrolls Online is one of the crafts in the game that’s not extremely difficult to master but is very beneficial if you invest in it. As I laid out in my Crafting Basics Guide, all professions require a commitment, and not just a time commitment but an inventory commitment so you have all the necessary items to level up and research all the topics. Woodworking covers all the staffs (Fire, Ice, Lightning and Restoration), bows, and shields, so you’ll be in high demand across almost all classes. So even though it’s a commitment it doesn’t have to be a painful grind, and you can actually level up quite quickly if you utilize your resources correctly from the beginning. To do this you need to know exactly how to earn Woodworking XP in the most efficient way since not all ways are equal. 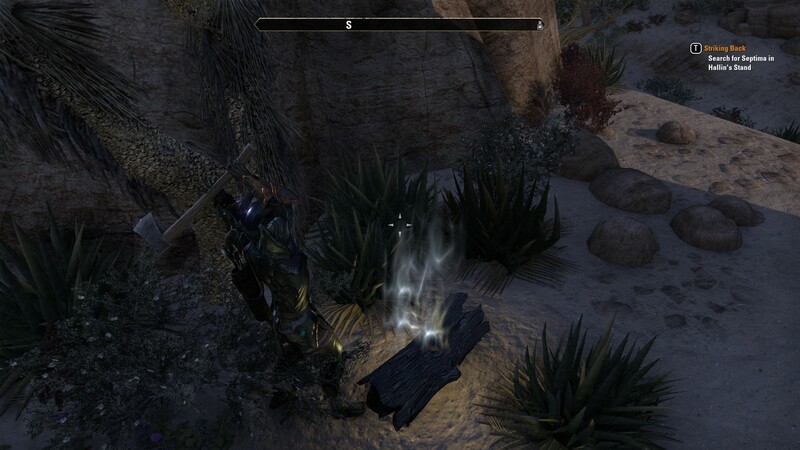 You can increase your woodworking by one level if you find the correct books scattered throughout Tamriel, and there’s nothing better than opening a book and hearing that sound before seeing the message that your woodworking increased to the next level. However you can’t rely on this solely if you want to reach level 40, which is the necessary level to unlock all the woodworking perks. The other two ways to gain XP is by either creating wood items or deconstructing wood items, and the trick to level up the fastest is with the latter. This is why you have to commit your inventory to collect as many wood items as possible even if they’re not items you use or can use. 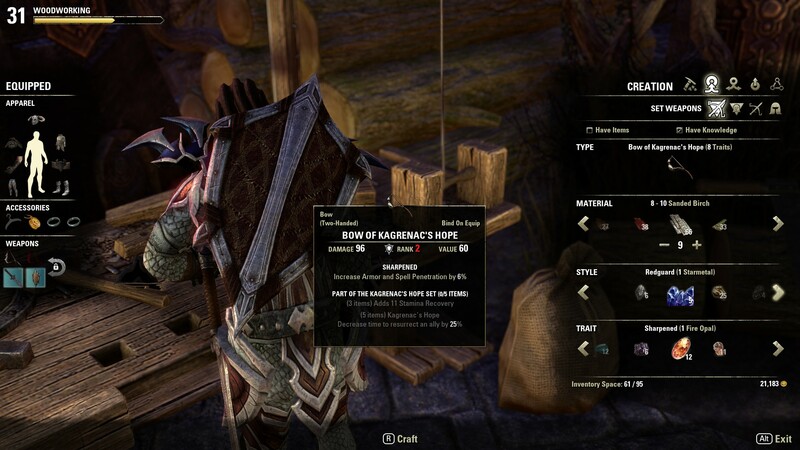 Still, it’s important to keep in mind that Elder Scrolls Online is an MMO and for as many weapons you can find by looting defeated enemies during quests you’ll still need to interact with others if you want to level up efficiently, and this is where creating wood items becomes extremely useful. All the Woodworking skills have 3 levels to unlock except Woodworking (yes they have same name), which has 9 and unlocking each one allows you to use a different type of wood. The different wood types correspond to different weapon levels. So with all of this information laid out how do you utilize your skill points efficiently and also level up the fastest. So how do you know if using that skill point to unlock the next level of Lumberjack Hireling is worth it or if you should level up Keen Eye at all? Well, that’s why I’m here. And making the best weapons isn’t just based on crafting a weapon of a higher level but the traits and enhancements you can apply to it so you’ll have to research all of them first. Unless you’re making weapons for other players who are at higher levels than you, you won’t need to use all your skill points to unlock all the wood types at first but I will explain later why it’s beneficially to be able to craft weapons for levels higher than you. Keen Eye makes it easier to identify wood in the world at different distances. So I recommend using a skill point as soon as you can unlock Keen Eye so you can find wood but it’s not necessary to use skill points to unlock the next 2 levels until much later. Lumberjack Hireling is very important as you’ll get necessary wood items delivered to your mail every day, and I recommend unlocking the additional levels whenever possible. The deliveries are very good and you’ll get plenty of materials that will help you improve your wood items all the way to legendary status. Wood Extraction improves the items you receive when you deconstruct wood items, and you’ll see why that’s so important to leveling up faster. 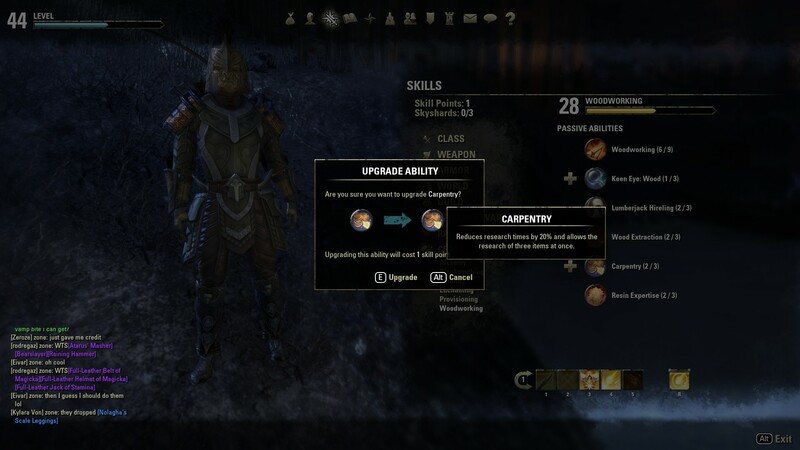 Carpentry reduces the time it takes to research a trait, and since it also allows you to research more than one trait at a time it’s important to unlock this as soon as it’s available because research times can range from hours to weeks. Resin Expertise improves your ability to upgrade weapons from standard to Legendary by requiring fewer items to increase your success rate. Considering the fact that Legendary weapons don’t improve with your character’s rank I recommend waiting until you reach veteran status before crafting a Legendary weapon for yourself because you’ll get more use out of it. However Resin Expertise is important to increasing your weapons’ stats even without reaching Legendary status. Now, the majority of your time will be spent constructing/deconstructing weapons and researching topics. I already mentioned the importance of deconstructing items you loot but you’ll notice early on that you don’t get much XP from constructing wood items. You earn about 5 times more XP from deconstructing items than you do constructing them. However you’ll have a ton of wood to use to construct items so instead of wasting it, find someone you can exchange your constructed items with and then deconstruct their crafted items. You can ask someone in your guild or just mention it on general chat because there’s always someone looking to level up as well. The two of you construct the same weapon (rank), trade them, and then deconstruct them. Depending on your Wood Extraction level you should acquire even more wood items to construct more weapons and repeat the process. This is one of the important reasons to be able to craft items higher than your current rank because the XP you’ll get from constructing, exchanging and deconstructing will be amazing and you can level up anywhere from 1-5 levels in just one session. For this process Woodworking, Keen Eye, and Wood Extraction skills are most important so if you just want to level up quickly those 3 skills are the most important. Researching topics is more difficult and that’s because there are —– traits that can be researched for each weapon. So if you research one trait for bows it doesn’t give you access to that research trait for the staffs. And the research time increases exponentially with each research trait you unlock. So the first trait you research for bows will take a few hours but if you’re researching the last trait for bows it’ll take almost 4 weeks, based on your Carpentry rank. There’s nothing you can do to speed this up after you start, and you despite being able to research more than one trait at a time you’re limited to researching one trait per weapon type at a time. And you’ll find it increasingly difficult to find a weapon with the particular trait you need to research. However you can trade/buy weapons from someone else with that trait and research from there. For example, if you need the training trait you can go to any Fighter’s Guild, buy that weapon with that trait and then research it. There are also Guild Traders scattered throughout the land now and you can purchases weapons with specific traits through them that others are selling so this will save you a lot of time in your hunt. 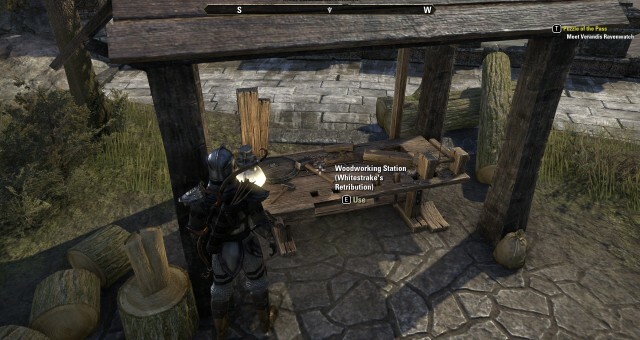 Hope this guide to woodworking in Elder Scrolls Online gets you started on your journey to become the best woodworker in all of Tamriel.